In the present world of martial arts, there exist many great styles and great masters who teach it. As a tenth degree black belt in Hapkido, a one time personal bodyguard to the former South Korean President Park Chong Hee, a leading man in eight 1970s martial arts movies and the trainer of the United States' special forces during the Vietnam War, Grandmaster Kim Jin Pal is certainly among the elite. Though his biography is lengthy, it is the only way to understand the depth of his life long experience. The origin of his legendary skill traces back to his early youth. Grandmaster Kim was born in April 2, 1941 in a town named U-Pori Il-Gu(Seu-Chung), South Korea. Growing up amidst a chaotic state brought about by the civil war between the North and South Korea, Grandmaster Kim had to resort to fighting to protect himself against the oppressions of the rampant street gangs. Even though ferocious by nature, to be a more effective fighter, Grandmaster Kim sought training in Ssirum, a folk style Korean wrestling, and Karate (note: this is the form of Karate that originated from Japan and is comprehensive in all aspects of fighting ranging from hand strike, kicking, grappling and throwing techniques. No relations to the form of Karate that was developed in the United States such as Kempo, which focuses mostly on hand strike techniques). At the age of 16, he left his hometown to move to the city of Daegu Sin Chun and expanded his martial arts training to Judo, Kendo, as well as Tang Soo Do (Chung Do Kwan). In 1960, he attended the military police academy and upon completing basic training, he was assigned to the Department of Defense and sent to Seoul, Korea. There, he began his training in Hapkido with Grand Master Ji Han Jae, the founder of modern Hapkido. It was Grand Master Ji Han Jae was responsible for incorporating various unique kicking techniques to Hapkido. In 1961, South Korean General Park Chong Hee staged a revolt against the government and initiated martial law. Being in a dangerous position, General Park decided to recruit top military members to be his bodyguards. There were 500 elite military members who were chosen for the try out. After a series of intensive testing including shooting, hand to hand combat, verbal skills and last but not least good looks, 30 individuals passed for the position. Grandmaster Kim was one of them. After an election in 1963, General Park Chong Hee became the new president of Korea. When president Park took his administration duties in the Blue House (the equivalent of the US White House), Grandmaster Kim continued his duty as his bodyguard. Two years later, in 1965, as the Vietnam war was becoming highly volatile, Grandmaster Kim was reassigned to Vietnam as part of the Republic of Korea Criminal Investigation Division (Bi Dul Gi Bu Dea). During his time there, he applied his martial arts skills and established an impressive record. First, he gathered a large group of followers and became the only foreigner to be allowed to open a martial arts studio in Vietnam. His studio stood six stories high and had over 1000 students. Next, he was asked to instruct the bodyguards for the Prime Minister of South Vietnam, Nguyen Cao Ky. Then, during the visit to Korea by the American President Lyndon B Johnson, Grandmaster Kim was requested to go back to Korea to be in the bodyguard detail for President Johnson. When he came back to Vietnam, he was asked to teach the American military forces such as the Green Berets, Military Police and the 355th Aviation Company. In 1968 he traveled to Nha Trang, and established a martial arts class for the US Air Force station. After the establishment of the class, he left it to the care of Cho Sung Ho as the head instructor. In 1971, with the slow withdrawal of the American and other allied country out of Vietnam, Grandmaster Kim left his studio in Saigon to the care of Dr. Con Gia Pham, presently a 9th degree black belt and Associate Clinical Professor, UCLA School of Medicine. He then moved to Hong Kong, married his wife, Sue Yun, and opened the Flying Tiger Hapkido Studio, the largest martial arts studio in the city. In 1973, after appearing in Hong Kong Television, he was cast by Kea Fa International Film Corporation as the leading man in his first martial arts movie "Tiger". With it's tremendous success all over Southeast Asia, he became the star in seven other movies "The Mandarin", "Black Guide", "Valley of the Double Dragon", "Jet-do Karate", "Code Name Panther", "Dae Ha Drama" and "Evidence". During this time, all the major studio stars and stuntmen practiced at his martial arts studio.Some names of note are Jackie Chan, Angela Mao, Sammo Hyung, Chan Na, Wang Kum Bong and Chuan Jun. He also took in one of his most loyal student, Master Thomas Lok, presently an 8th degree black belt teaching under Jin Pal Hapkido Federation in Regina, Canada. During this time, he was also invited to Singapore by Sunny Tan Sar Bee to give seminar to the Singapore Police Academy. He even taught the Crown Prince of Bahrain and his body guards the art of Hapkido. 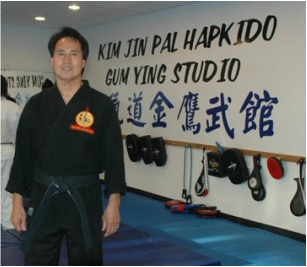 In 1982, with the intention of expanding Hapkido to the western world, Grandmaster Kim moved to the United States and settled in Southern California. For the next ten years, he taught the Irvine SWAT team, established a Hapkido class at El Toro Marine base and in 1987 was elected as the president of the World United Martial Arts Federation. In 1993, with the intention of incorporating Hapkido to the security forces of the United States, Grandmaster Kim relocated to Washington DC. There, he instructed US DEA agents and the DEA's Chief of Operations Management, William Simpson. He also taught the George Washington University Men's Basketball team, opened Hapkido class in the White House Athletic Center and trained 1988 Boxing Olympic Gold Medallist, Andrew Maynard. Several years later, he moved his studio to Rockville, Maryland. He successfully trained Washington Redskin Linebacker Ken Harvey to attain a black belt in Hapkido. Together, with the help of his son, 5th degree instructor Master Eric Kim, they have built the new place into a strong and thriving martial arts studio. With his great talent and a kind heart, Grandmaster Kim has amassed and produced many high quality masters and instructors. There are now nine different Hapkido studios all over the world that is under the Jin Pal Hapkido Federation banner.